With the warmer spring weather, I had some lovely spring weather outfits planned to wear my new shoes. Unfortunately we were in for a wet week, and I didn't want to ruin my new shoes in the rain. So I went back to basics for workwear, with black pencil skirts and printed tops. You know I love a bit of matchy-matchy! 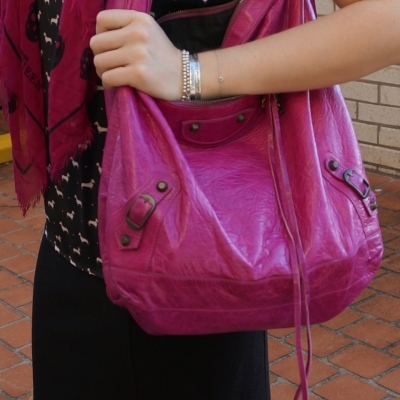 This magenta Alexander McQueen skull scarf and Balenciaga day bag are frequently worn together. With the purple outlines on the dashounds on my top, it felt like a great matchy-matchy outfit for the office. Kept the rest of my outfit simple with the black pencil skirt and the black ballet flats. Did end up regretting this outfit in the afternoon though! Around lunch time the rains arrived and I was very cold and wet by the time I got home after work that evening. Probably should have picked tights or a cosier jacket (I just had a blazer in case any meetings came up). Despite the less than perfect weather conditions, I did like this outfit. I even had a rare opportunity before the rain started to pop out for lunch and have a browse at the Jeanswest store in the city. Last worn: Ana Luisa earrings, roses print skull scarf, dachshund print top, black pencil skirt, Walnut Melbourne ballet flats, magenta Balenciaga day bag. Other ways to wear: roses print skull scarf and striped dress, dachshund print top and burgundy pants, black pencil skirt over a dress, Walnut Melbourne ballet flats and olive pants, magenta Balenciaga day bag and maxi skirt. 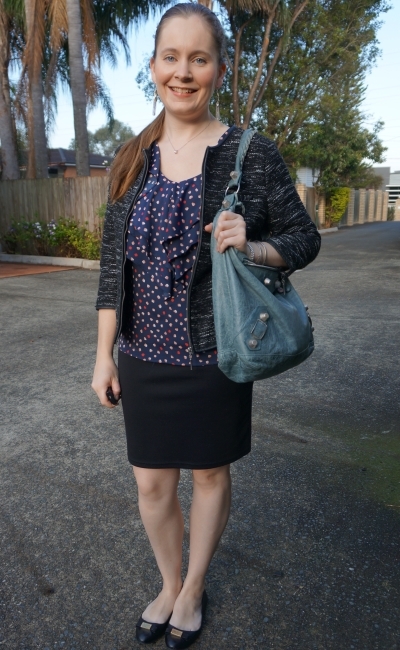 Perfect for pregnancy: roses print skull scarf in third trimester, dachshund print top in first trimester, black pencil skirt in second trimester, Walnut Melbourne ballet flats in second trimester, magenta Balenciaga day bag in third trimester. I didn't like this outfit as much as the one above. It was something I'd picked as a second choice because of the forecast rain which meant it was already off to a bad start! I wasn't sure about this boucle blazer and the polka dot print tank, but in the mirror that morning it looked good enough for me to pick the boucle jacket over a plain black blazer. When I reviewed the photos later though I regretted my decision - a plain jacket would have looked better over this. Bad jacket choice aside, it was an otherwise okay outfit. The Balenciaga day bag doesn't look as nice with it as I thought as the shades of blue are so different, but it's definitely not the worst thing about this outfit! I really don't know why this top is worn so little, I get compliments when I wear it and it is always so fun to wear. Last worn: boucle jacket, statement earrings, polka dot ruffle tank, black pencil skirt, Marc By Marc Jacobs ballet flats, Balenciaga tempete Day bag. Other ways to wear: boucle jacket and a-line skirt, polka dot ruffle tank and jeans, black pencil skirt for YouTube creator day, Marc By Marc Jacobs ballet flats and striped dress, Balenciaga tempete Day bag and printed shorts. Perfect for pregnancy: boucle jacket in second trimester, polka dot ruffle tank in second trimester, black pencil skirt in first trimester, Balenciaga tempete Day bag in third trimester. A black pencil skirt is a corporate office wardrobe essential! It's so easy to throw on a printed top with a plain black pencil skirt and feel ready for work. As you can see from my lessons above though, it pays to put a little more thought into the weather for the day and your accessories when picking such a straightforward outfit! Linking up with Fashion Frenzy, Oh Hey Girl, Style On The Daily. I like both outfits, scarf and top from the first one are really cute. I think that boucle jacket looks really nice in the second outfit and that polka dot tank is so lovely! I like both outfits as it conveys a different style. The first because you had a scarf says cozy while the second one says chic with the blazer. I do love the pop of magenta on the first outfit and I can see why you pair your scarf and bag together often. It's a beautiful combination and I would do the same. I hope the rain lets up a bit on your end this week and give you a break from the wet and cold. If not, stay dry and warm and have a very happy Monday! Thanks Maureen! Thankfully the rain didn't stick around for too long! Oh I love the magenta scarf and bag in the first outfit! Such a pretty color and very flattering on your skintone. And I love the jacket you chose to complete the second look - very sophisticated! Love the pencil skirts and that pink bag!! I love the scarf and bag as they pull everything together in the first outfit, Mica! I'm sure the second outfit is just darker which may be why it's not your fave...but it still looks wonderful! I'm happy to report my week should be very productive...as long as I get a nap today...ha ha! haha I could have done with a nap today! Was a long day! Love both the looks but like you my fav is the black and pink. The colours just look amazing together. Have a great week. I love these black pencil skirt outfits! So cute and chic! The dog print top is my favorite. So so adorable! Like the colour of the scarf! Liked the first outfit, the purple bag and scarf are such a good match. This is very office appropriate! Great looks! This look is so cute! I love that magenta color! It looks great on you, hun! YOU look amazing! And yes, you should definitely wear that secoond top more often, it's classy, fun and work-appropriate. That jacket is beautiful too! Pencil skirts are my fave when it comes to wearing it at work. I love that your magenta scarf and bag matches! It's a bummer that the weather turned around. At least you got home safely! Love that you have similar Balenciaga bags! Both outfits are great. Also you can never go wrong with basic piece. I hope you have an awesome week. We just spend the weekend at home. Sorry you are having a rainy week - we've been having a lot of rain too, and it's just no fun! I love the cute dog print on your blouse! Thanks Lydia :) Luckily the rain didn't hang around for too long! The Alexander McQueen Skull Scarf is perfect!! I love it! It adds a bit of edginess to your outfit, which I love! And the Balenciaga bag is very pretty. It looks very roomy, lots of space. It has been raining a lot here in Florida, every day, so I am ready for some sunshine! So cute and professional Mica! Love the matching scarf and bag. That bag is so gorgeous! I love it and I love how you styled it! I love the first outfit - you look great in that magenta colour. With the second outfit, I am not a fan of that top. What do they say, if someone compliments the item, it's not doing anything for you; if they compliment YOU, then it's a great item. Something like that? The first top fits you really well, and accentuates your shape; I feel like the second one is taking over the whole outfit. You deserve a less bossy top! Both outfits are so cute! I absolutely love your top with the little dachshunds on it. That scarf goes so well with that top too! So fab! Love the pink bag! I'm such a fan of Balenciaga- that pink number is gorgeous! I really love the color of the first bag and I don't think it looks matchy-matchy! Sorry about the weather, but you still look fab! Have a wonderful week! I like how you showed different aspects of your personality in both looks.The first look was fun and playful with the pop of pink and skull scarf and the second look is classic and timeless. At least you liked the first outfit although it became so cold and started raining! I like it, too, but honestly understand why you would have preferred a plain blazer together with the second look but as the top is so beautiful your blazer choice definitely doesn't matter! haha yes, spring and autumn are so similar like that! Pencil skirts are so awesome because you can match them with anything and it still looks wonderful. Also, I love the way that you've matched the pinks in the first outfit - it's so perfect for so many occasions. Super cute outfits!! Love your bags! I admit I don't own a black pencil skirt, sen though it has been on my to buy list for office for a long time. I agree with you, it is such a classic and easy to dress up or down. Definitely a classic, probably why I have the two in my wardrobe, haha! A black pencil skirt is really such a great staple, Mica:) Although I do like the first outfit more, I think the second one works as well! I love that jacket:) And yeah...we've been getting a lot of rain here too...so annoying! I love the way that scarf and bag in the first outfit look together! That is a great outfit! I can understand when weather gets in your way a bit, it has been incredibly windy and wet here lately. Hopefully you have dry weather next week! You have such a great collection of handbags! I love both of these, especially the magenta one! Wonderful spring outfits. I'm a big fan of pencils skirt and I would say that a black pencil skirt is an item we should all have in our closet. Pencils skirts look great paired with printed tops. It's a lovely outfit formula and you wear it so well. You look beautiful in both looks. I can't exactly pin point why, but I prefer the first look. Maybe because of the adorable scarf and earrings? Both outfits are beautiful, though. I'm sorry you got so wet! I have definitely had those days! I love the pops of magenta with the black outfit! Such a cheerful addition to the outfit! I think that both looks are great. It's too bad that you got so cold in your first outfit though. Hope you have a wonderful rest of the week. I really love your scarf and bag in that first look! It's always fun bringing in color to an outfit. Glad you got some fun shopping in! I especially love the outfit with the pink bag, the colour really pops! Oh I love the bag babe! I am absolutely LOVING the magenta shade in the scarf, SO gorgeous, Mica!